Kartamishevsky Lane is a small alley off Kartamishevskaya Street in the lower left of the map, two streets above Dalnitskaya. 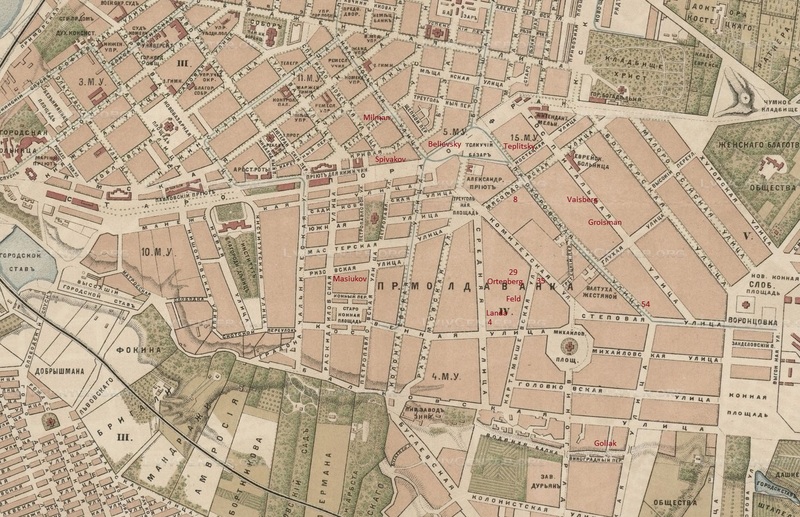 According to Semenov’s report The Jewish pogroms in Odessa and surrounding area in 1905, there was a vicious attack and murder of 29 Jews at 7 Kartamishevsky Lane. Another street in which all the inhabitants of buildings were massacred was Prokhorovskaya Street, mentioned in the next newspaper article, to the right and running northeast from Dalnitskaya. The photograph below is 9 Kartamishevsky Lane which may look more like the lane was in 1905 as the next building is a long two-storey 1930s-looking public building set back from the road. Some tragic episodes of the reign of anarchy are now coming to light. A Jewish house in Prokhorovskaia Street was being defended by 46 railway workmen, when a company of infantry headed by a police officer appeared. The soldiers shot and killed everyone of the defenders. The mob then pillaged the house and put all the inmates to death. A band of hooligans appeared before the Jewish agricultural school and demanded money. The headmistress gave them all she had on condition that the lives of 35 orphaned pupils should be spared, and induced the men to depart. They reappeared later, however, and ransacked the school. The children fled, pursued by the cowardly ruffians, and eight of them were killed. There are only 10 children in the pogrom death records age 13 or under and five of them had a parent on the list. Another, Elena Weingurt, had a family described in newspapers, two more had details of their fathers mentioned, and one had no known family – Boris Pasekov, 8, whose patronymic is not listed. So he is probably the only one, and possibly the other two with details of their fathers, who might have been part of the eight children from the orphanage. ‘At our house’, said the wounded Rakhil Pomerantz, ‘18 people were killed – Spivakov, Milman and his wife, the shoemaker and his wife, the carver Lieba and many others. The rest were wounded.’ Reikhnis reported: ‘I saw Raikher and Vaidober killed, and the hooligan-guards raped two women. The wounded old woman Podkaminer said that they beat her with a blunt tool and after that they beat her son for a long time and then threw him from the attic. In the death records, there is a Moisei Abramovich Spivakov, 60, an Aron-Moishe Khaim-Mikhelev Spivakov, 23, an Aron-Usher and Mintsya Milman, 46 and 40, a Menashe Avrumov Raikher, 20, and a Leib Avrum-Itskovich Vaidaber, 21. Then 43 Srednaya was taken by an attack of Cossacks after an offensive by watchmen. At the time of this defeat, everyone was wounded, and a girl and a few men were killed. A great quantity of houses were wrecked by machine-gun fire. The steward Goldenberg reported how they took the house at 14 Myasoedovskaya and destroyed it: in front, troops advanced with drums, robbers following behind. At the house, some soldiers burst in crying, ‘Hurray’, the rest opening fire. After they took the house, there were 8 dead and about 40 wounded left there. After the siege, the crowd of guards and soldiers began to take 7 Kartamyshevskaya St. In order to find out more about the people in the pogrom death records, I looked through the indexes of the Odessa 1902-3 and 1904-5 directories. Most people in the records probably did not own their own homes and would not appear in the directories. The directories in those years only have surnames and first initials so it was only if the name seemed quite rare that a first initial, or first initial of the patronymic (if it was a young person who might have been living with their parents), was likely to have been a possible match. If there were several families with the same surname, sometimes it was obvious that they were related, brothers working for the same business or living in the same house. Other times, especially when some lived in the centre and others in the poorer suburbs, it was difficult to know if it was the same family, and if it was, whether they were close and may have known or helped out if someone was affected by the pogrom. I thought about whether, if one member of a family owned a large house, it might have been common for relations to live in the same building, either renting apartments, or simply living together. 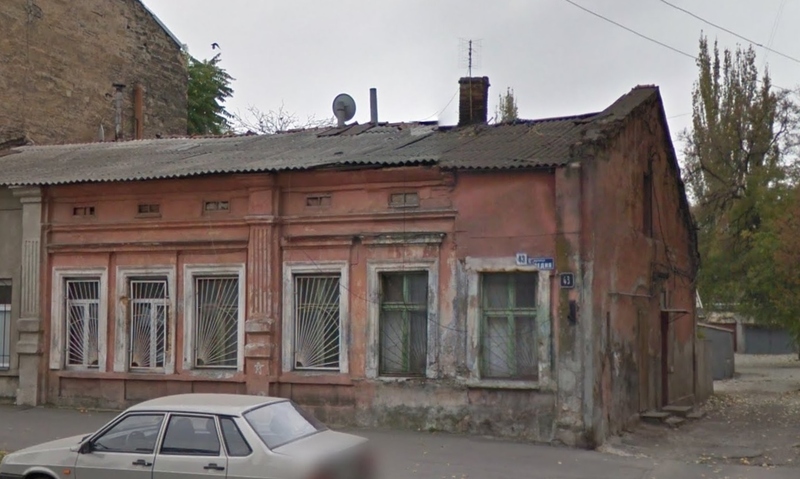 The only person in the death records who probably owned one of the houses written about in Semonov’s report was Itsek Landa, 30, from Kovel, as I. Landa owned the house pictured above, 43 Srednaya, in the 1904-5 directory. This was the house where a girl and a few men were killed. Putting together a few of the names and photographs of the houses begins to bring some substance to these forgotten ghosts. The other place I began to look for families of the people who died in the pogrom was on the Ellis Island website, as, if their families emigrated to America along with the thousands of Jews leaving Odessa and Russia at that time, it would be easier to follow their lives through US documents. At first I checked the people leaving Odessa in 1906 but then found that many families left in dribs and drabs, first the husband or older children and later the wife and younger children, so I began to look at the years 1907 to 1912 as well. I found that from 1907 people had to list both their next-of-kin in their home town and the address they were going to in America, so in many cases the address of the wife or parent in Odessa was on the manifest. Through these ships’ lists I found several families who shared the name of someone in the pogrom records and also came from Moldavanka. I tended to look for families that seemed to have lost crucial members, children without parents, widows, or widowers. A few public records cannot tell much about a family, but certain facts about who was living with the family, their jobs, and especially the mistakes or little lies hint at stories between the lines. With a little thought and some imagination, it is possible to guess reasons why family members may have done one thing rather than another, gradually narrowing down motivations as more information comes to light. And as the thoughts are put down on paper, or on screen, sometimes what seemed to be disparate fragments of information come together and take on new meaning. My great-grandfather was Herschel (Harry) Landa who had a brother named Abraham Landa, both of whom left farms near Odessa during the 1905 pogroms and emigrated to the States. Abraham Landa’s family settled in the New Jersey area and Harry’s family changed their names to Landy and settled in New York State. It would obviously cross my mind that the two Landa brothers might have left Odessa during the pogrom because they had lost a brother or cousin. Why else would they have specifically mentioned leaving ‘during the 1905 pogroms’? In the Ellis Island records, there is a teacher Abraham Landa who travelled from Odessa to New York in 1907 to a friend. His wife remained in Odessa at their home on Moscovskaya Street in Perecyp. Another Abraham Landa left Odessa around that time, also a teacher, as reported in the Jewish press when he died in 1929: Geneva (Dec. 31) Abraham Landa, who came here from Odessa, active in educational and communal work, died here today. Mr. Landa was for 25 years director of the Jewish schools. So how many Abraham Landas were there in Odessa around 1905? Were any of them related? I didn’t find whether Itsek Landa had a wife and children, and if he did, what happened to them. I looked at the Yad Vashem database for Landas born before 1905 to see if any had a father called Itsek. There was one family of three children, born in 1900, 1903 and 1905, two daughters who died in 1941 and one son, Shmuel, who was killed in military service. Their mother was called Dvora and the father’s name was unknown. The testimony was given by Shmuel’s daughter. But then I found the testimony, also by the granddaughter, for Dvora, who was 71 when she died, and her husband’s name was Mordecai. Why was Mordecai not written on the forms of the children? Very close to the Landa house, and next door to 31 Srednaya where Dosik almost had his finger ripped off, was the home of Aron Ortenberg, 40, who is the only one in the death records so far whose family referred to his death in the pogrom on their online family information with a reference to the Odessa archive pogrom death records (Text: Entry 1942; Fond 39; Description 5; case 118; Page 336 rev http://wc.rootsweb.ancestry.com/cgi-bin/igm.cgi?op=GET&db=9224&id=I64 ) His wife Golda died in 1911. Among the Jews so slaughtered was Aron Ortenberg, my grandfather, father of my father, Michael, who was seven years old at the time. My father never once during his painful lifetime spoke to me of his childhood. He was murdered because he was a poor Jew, away from his home at the dockyard working to earn his paltry living. 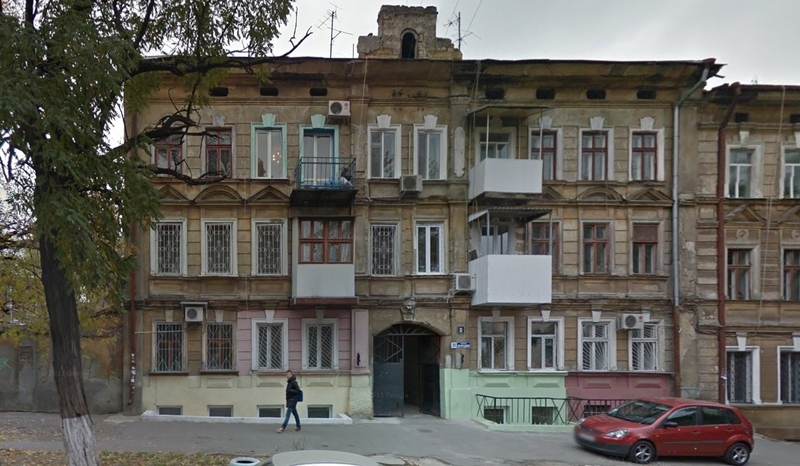 I’ve been to Odessa, to 33 Srednya Street in Moldavanka, the section for Jews and other outcasts. I have been in the two ten feet square rooms he lived in with his brothers and mother Golda Cohen Ortenberg. I have seen the kersosene stove they cooked on, the pit they used to relieve their insides. I have walked over the mud passageway that led to this courtyard of attached rooms. There are no other accounts of how the children of those who died in the pogrom were affected, but it is possible to find information or blank spaces in the records to do with ways of remembering and forgetting, which may indicate the emotional legacy. They may have named a child after a murdered parent, forgotten their immigration date, changed their birth date or place, hidden their parents’ names from their children, or not told their families where they were from. 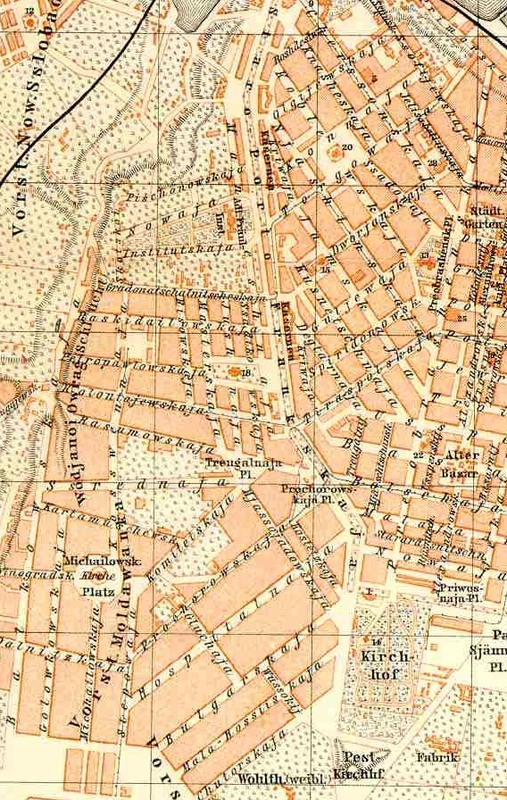 On the map above are the numbers killed as mentioned in the pogrom reports where the address was also supplied, and the names of several people in the pogrom records or their possible families where the address is known. This seems to have been the area where the police gathered much of their information about the pogrom by interviewing witnesses for the government reports. It may be because this area was investigated that the names were known and these people were listed in the records. Another person mentioned in the Semenov report is Spivakov who was killed along with 17 others. In the pogrom death records there are two Spivakovs, a 23-year-old Aron-Moishe Khaim-Mikhelev from Odessa, and a 60-year-old, Moisei Abramovich from Kherson. 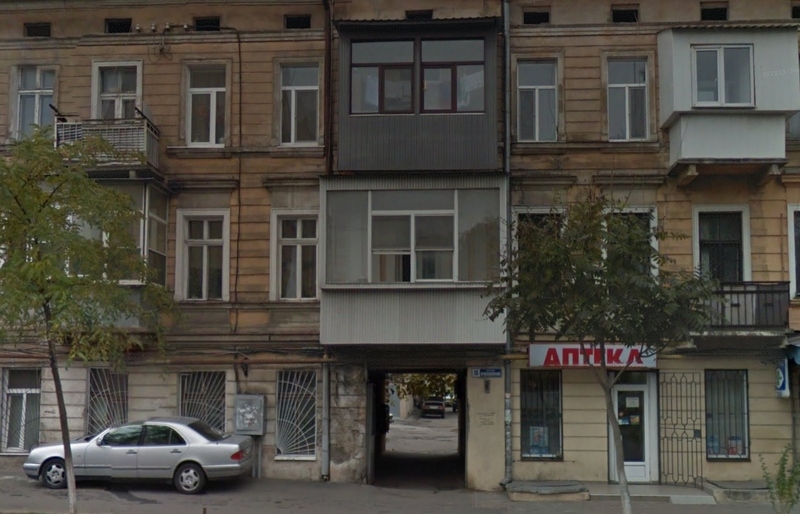 On the Fond 359 list of Jewish small businesses, there is a Moshko Abramovich who lived at Staroportofrankovskaya 76 and had a business in 1893 which may have been elsewhere by 1905. Those names are so close that they must be the same person. 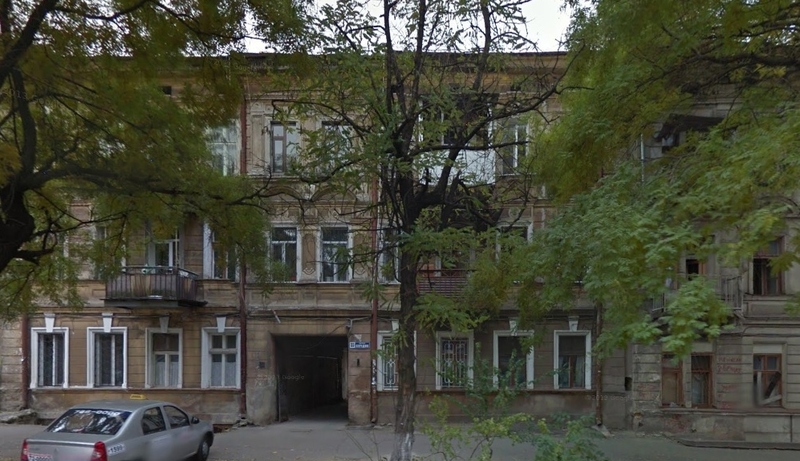 Another person in the death record, Khaim Beniaminovich Beliavsky, 18, may have lived very close at Staroportofrankovskaya 88, where a businessman Benyamin Abramovich Beliavsky lived in 1899. 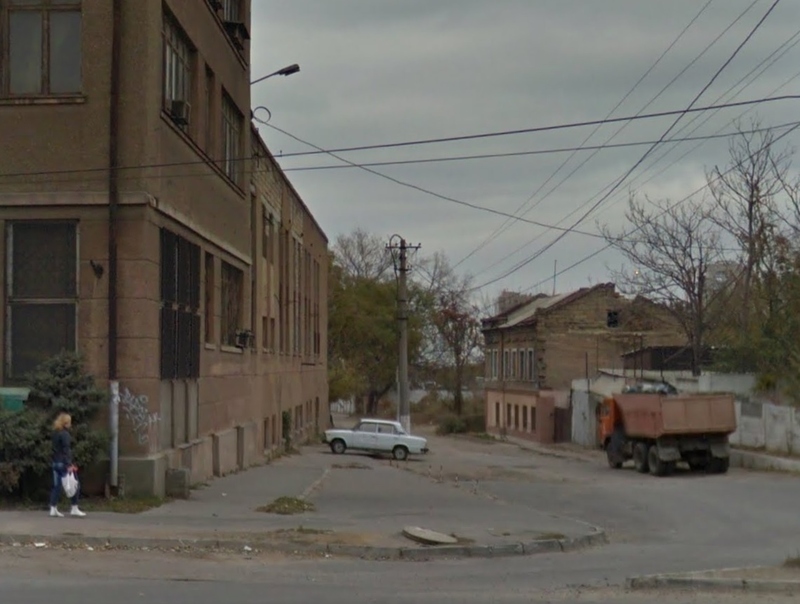 There were two other Spivakovs with businesses in or near Moldavanka, one on Malaya Arnautskaya and the other two streets away from Staroportofrankovskaya at Degtiarnaya 7. Another person who lived on Degtiarnaya was a Sh. Milman, at number 13. Killed in the group with Spivakov was Aron-Usher and Mintsya Milman. 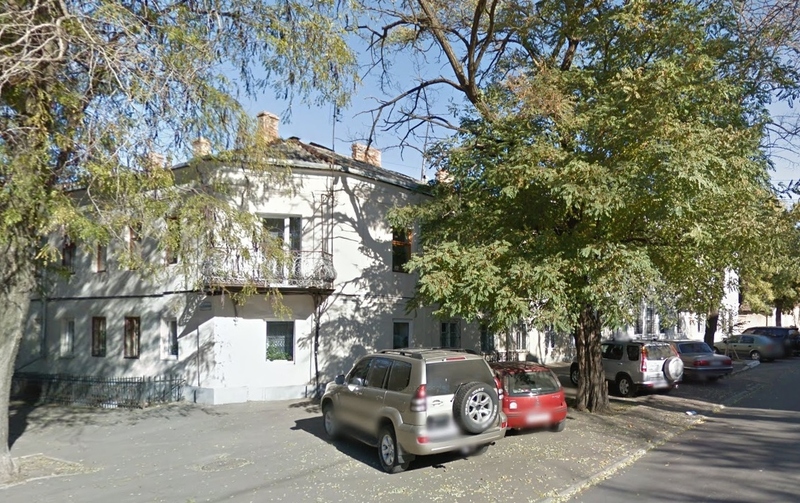 Another whose address I found in Moldavanka, is Luzer Duvidovich Goliak, 36, who is registered as having a business at 19 Vinogradnaya Lane in 1906 with his brother Falik and whose father, D. Goliak, owned the house according to the 1904-5 directory. His father,Duvid Moshkovich, had had a business in 1893 at 56 Balkovskaya. Vinogradnyi Lane is not on Google Streetview, being further out along Dalnitskaya, but looking down the lane from Dalnitskaya, the house on the right is probably 19 Vinogradnyi Lane. 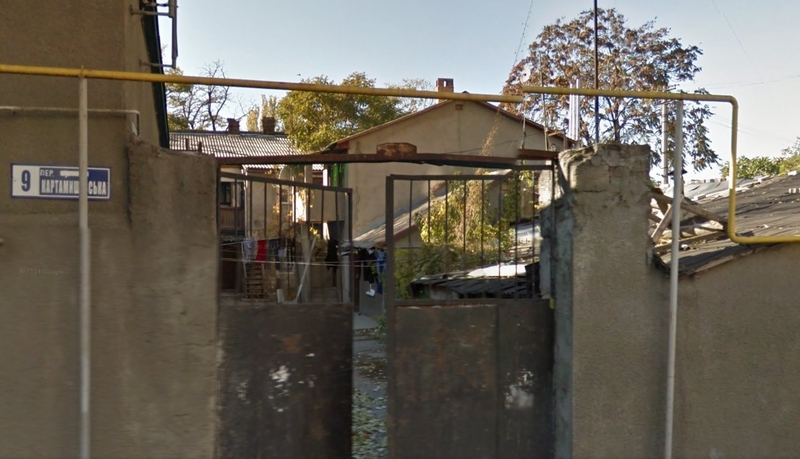 7 Vinogradnyi was another house attacked in the pogrom which is mentioned in Semenov’s report. Another possible address of someone in the records was that of Itskhok Leizer Ikhelev Teplitsky, whose father was most likely Leizer Teplitsky, a businessman at 39 Prokhorovskaya, the street where so many people were killed. His business is listed for 1893, according to Fond 359, so he was possibly no longer there in 1905. In the 1906 report, The Odessa pogrom and self defence, one chapter called ‘The battle in the attic: a girl’s story’ takes place in Moldavanka on Prokhorovskaya Street. The girl recounted that she lived in Prokhorovskaya Street, and that about 50 people had gathered in an attic, mostly women and children, plus a few men and teenagers. Again there is mention of many children, unlike in the records. The caretaker stood at the gate and said that all the Jews had run away but the crowd did not believe him, forced their way into the courtyard and poured into the apartments. Up in the attic the trembling people could hear thuds and shouting. We sat in the attic with the pogrom going on beneath us. They were already killing. One young boy was very neat and delicate – they dragged him out and said: ‘So clean and tidy, you must be a student!’ They broke off a thick table leg, and with it smashed his chest, bashed his skull and killed him. They carried on killing for a long time and the screaming could be heard all around the courtyard. Sitting in our attic, we could hear the shouts, cries, breaking glass, clattering of feet, the wailing of mourning.